After Suleiman the Magnificent the Ottoman Empire became very strong. In the east, the Ottomans had defeated Persians. In the north, Ottoman horsemans attacked Moscow area. The Russians was very weak in 16th century. In the west, the Ottomans had defeated Europeans. In south, Ottoman Empire was the strongest power. Following the death of Suleiman the Magnificent, his son Selim II became emperor of Great Ottoman Empire. Selim II was uneducated. But new emperor was smart. He wanted to capture Cyprus, take back Tunisia and attack Central Europe. But there were riots in Yemen. Ottoman army sent troops to this area and killed the rioteers. After this problem had been dealt with, Ottomans began preparations for invading Cyprus. The Ottoman navy was much stronger than most of the European navies. Even the strongest European states were afraid of Ottomans. In 1570, the Ottoman navy left Istanbul. By July, they reached Cyprus. Cyprus was ruled by Greeks and Venetians, with a navy which lived on piracy. This navy raided many of the Ottoman ports. There were several castles in Cyprus. Then the Ottoman–Venetian War (1570–1573) started.The Ottoman navy easily destroyed the Cypriot navy. Then the Ottoman army landed and attacked and captured the Cypriot castles. Finally, Ottoman army besieged Nicosia castle. But Greeks and Venetians successfully defended this castle for seven 7 months later. However when the Ottoman army captured last castles Cyprus was absorbed into the Great Ottoman Empire. Cyprus was very strategic island in the East Mediterranean. In 1571, the Ottoman navy left Cyprus, sailing for the port of Lepanto in Greece. This navy was enormous, with over 200 warships. Ottoman soldiers in Lepanto port, navy was break. Also European states funded an enormous navy. This Crusader navy had over 200 warships. Crusader navy wanted to destroy the Ottoman navy in Lepanto. The Crusader navy reached the Adriatic Sea. Ottoman navy commanders heard about this. Crusader navy came to Lepanto, fastly. Ottoman commanders called soldiers to warships, urgently. But when the alarm, Crusader navy entered Lepanto port. Crusader warships started to fire. Hundreds of Crusader warships attacked Ottoman warships. Whereas Ottoman warships were not ready. Thousands of Ottoman soldiers died. The Ottoman warships that were prepared attacked Crusader warships. Thus, thousands of Crusader soldier died, but very little Crusader warships sank. Later, Crusader navy leaved Lepanto Port (Battle of Lepanto). Over 20.000 experienced Ottoman soldiers died, and 250 Ottoman warships sank. Whereas over 7.000 Crusader soldiers died and 15 warships (According to some sources 17 - 20 warships) sank. Ottoman navy downfalled and power lost. Sokollu Mehmed Paşa was prime minister of Ottoman Empire. He very sad this event. Later, Mehmed Pasha decided for Ottoman navy. A new fleet was built. Thousands workers worked for this mission in shipyards. Hundreds warships was ready for Ottoman navy. Only in year, Ottomans founded new and strongest navy in East Mediterranean. Sokollu Mehmed Paşa sayed to Venetian Ambassador: "By conquering Cyprus we have cut off one of your arms; at Inebahti by defeating our navy you have only shaved off our beard. However, you know that a cut-off arm cannot be replaced but shaved-off beard grows thicke!" (Original: Biz sizden Kıbrıs'ı almakla bir kolunuzu kestik. Siz ise donanmamızı mağlup etmekle, sakalımızı tıraş etmiş oldunuz. Kesilmiş bir kol yerine gelmez ama tıraş edilmiş sakal evvelkinden daha gür çıkar!). Ottoman navy was strongest navy in Europe again. 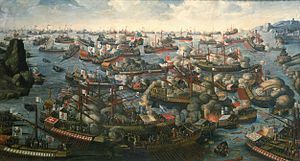 Ottoman emperor Selim II wanted to revenge of Lepanto. New Ottoman navy set out. Spanish army and navy were in Tunisia. Over 300 warships and thousands experienced Ottoman soldiers reached Tunisia. In June, enormous Ottoman army and navy attacked Spanish. Ottoman army won conflicts. Later, captured Spanish castles in Tunisia. Thus, Tunisia was part of Ottoman Empire. Later this victory, while he was having bath, he fell down and then, he had brain hemorrhage, he died. Ottoman people was very sad for this event. Ottomans like he and Selim II was successful emperor. When he died, area of Great Ottoman Empire was 15.162.000 km2. In 16. century, Great Ottoman Empire was strongest and biggest state on the world. Afterthe death of Emperor Selim II, Murad III became Sultan of Ottomans. He was young and smart. He wanted to gain more power and destroy his enemies. In the west, the Spanish Empire was very strong. This empire was the most important rival for the Ottoman Empire. The Spanish army captured a lot of Africa areas. Morocco State was occupied. Sultan Abdülmelik came to Istanbul and wanted to help. He wanted to Ottomans drive the Spanish out of Morocco. Young sultan Murad III agreed. During those events, Ottoman architecture was improving. For example Mimar Sinan made Selimiye Mosque. In the east, Persian State was enemy for Ottoman Empire. Sect conflicts started and Persian State wanted to some places. In 1578, Persian state declared war on Ottoman Empire. Persian army, had nearly fifty-thousand soldiers. Persian army wants to destroy Ottoman army in area. Persians passed Derbent and made battle with Ottomans. Ottoman commander was Yakup Bey. Persians was stronger than Ottoman army and Persians won. Commander Yakup Bey died. Persian commander was Quli Khan. This problem was very important for Ottoman Empire. Osman Pasha was commander of Derbent and had nearly 17.000 soldiers. Persian army came to near of Derbent. Persian commander was sure for victory. Because Persian army was very higher than this Ottoman army. The war continued for two days. First time, battle did not result. Battle continued in the night. Ottoman soldiers fighted with torches. In the morning, Ottoman soldiers slashed Persian line. And Ottoman Army won (May 11, 1583), (Battle of Torches). Ottoman army recaptured other places. During those events, some problems was in Morocoo. When Murad III became emperor of the Great Ottoman Empire, Spanish and Portuguese trying make colonize Morocco. Morocco Prince Abdülmelik Khan supported Ottoman powers on the Morocco. Ottoman government wants to colonial Morocco of Ottoman Empire. Ottoman government ordered to governor of Algeria Ramazan Pasha for attacked Spanish and Portugals in Morocco. Sultan of Morocco was Mohammed III supported Portuese and Spanish. Ramazan Pasha, entered Morocco area with 15 thousand soldiers. Abdülmelik's army had nearly 5 thousand soldiers and this army merged with Ottoman army. Thus, Ottoman alliance army had nearly 20 thousand soldiers. But Morocco army had over the 60 thousand soldiers and very higher than Ottoman alliance army. But, Ottoman soldiers destroyed Morocco army easily. Thereon, Abdülmelik became sultan of Morocco. But old sultan Mohammed III wanted to help from Portuguese and Spanish. Then, Philip II was emperor of Spanish Empire. Portuguese army entered Morocco area. Available of Ottoman army reached 55 thousand soldiers. Ottoman army made war with Portugals in Vadis-Seyl place. Ottoman alliance army won. Portuguese king and his aristocrats died in this war. Old sultan of Morocco Mohammed III caught and died. Thus, Morocco was colonial place of Ottoman Empire. Also, a minor Ottoman navy reached Morocco coasts and destroyed Portuguese warships. A two years later, Portuguese Kingdom downfalled. İmportant problems were ın the west. Also, Persians made treaty of Ferhat Pasha with Ottoman Empire (Treaty of Ferhat Pasha). Thus, some places became area of Ottomans (1590). But, Austrian Kingdom often delayed taxes. This was not legal. Also, some Austrian soldiers entered Hungary - Croatia and was unrest. Governor of Bosnia Telli Hasan Pasha attacked Austrian area. In 1593, Austria - Ottoman war began (Long War). Since 1566 (Siege of Zigetvar), Ottoman was freund with Austrian Kingdom. This war continued for 13 years. During Murad III period, Ottomans didn't win. Nevertheless, Austrians didn't win too. In 1595, Emperor Murad III died. 11 days later, Mehmed III became emperor of Great Ottoman Empire. He was 28 years old. Austrian army attacked Hungary all power. Ottoman army was un prepared. Nevertheless, Austrian army did not win. Austrian army sieged Esztergom Castle. And Austrians captured Esztergom Castle. Austrian soldiers killed hundreds Muslims and Turks. Mehmed III was commander of Ottoman army. He was in Belgrade. Some rebellions was in Romania. Ottomans made war with Austria, also involved with Romania. Romanian army raided to Ottoman army in Danube. Over 70 thousand Romanian soldiers, attacked Ottoman army suddenly and thousands Ottoman soldiers died. Ottoman Empire lost control of Romania. In 1596, Emperor Ottoman army entered Hungary area. In north of Budin, Ottoman army sieged Eger Castle. This castle was very strong. During siege, Austrian army reached Eger area. Also, Ottoman emperor Mehmed III was there. Austrian army was higher than Ottoman İmperial Army. Thousands Austrian soldiers entered Imperial Camp. Few Janissaries fighted with Austrian soldiers. Also, Ottoman emperor fighted with Austrian soldiers. Austrian army disintegrated suddenly. Thus, very little Ottoman soldiers won (Battle of Keresztes). Later, Eger Castle fell. Nevertheless, Austrian army continued atacks on Ottoman area. On October 1600, Ottoman army sieged Kanizsa. During siege, Austrian army reached Kanizsa. Austrian army had 40 thousand soldiers and nearly 100 cannons. Ottoman army made battle Austrian army. Janissaries disintegrated. Already, Janissarie army lost power since end of 16th century. But, Ottoman-Tatarian and sipahi soldiers attacked Austrian army continuous. Thus, Austrian army disintegrated and Ottoman army won. On October 22, 1600; Kanizsa surrendered. Tiryaki Hasan Pasha became governor of Kanizsa. After victory of Kanizsa, Ottoman army turned to Belgrade. Also, Austrian army continued prepare for recapture Kanizsa. On September, 1601 Austrian army came to Kanizsa. Austrian commanders were sure for recapture Kanizsa. French, Hungarian, Maltese, German soldiers were in Austrian alliance army. This army had over 100 thousand soldiers and a lot of cannons. Austrian spies, stated Ottoman Castle had not cannons. Austrian commanders delighted for this news. But, it was Tiryaki Hasan Pasha's trap. Kanizsa had 100 little cannons. Austrian siege began. When Austrian soldiers approached to Kanizsa Castle, Ottoman cannons fired. Austrian soldiers surprised and shortly after, Austrian siege powers disintegrated. A lot of Austrian soldiers died in front of Kanizsa. Ottoman losses were very few. Austrian army, brought big cannons in front of Kanizsa. Also, Ottoman army was away. Kanizsa was alone. But, Tiryaki Hasan Pasha was resourceful and intelligent. Hasan Pasha set new traps for Austrian army. Austrian cannons fired and Kanizsa castle worn. Kanizsa Castle endures. A Hungarian soldier captive. A Ottoman sergeant said this prisoner; "I supported your army secretly, this castle is very strong. Tiryaki Hasan Pasha is Hungarian. He had a lot of cannons and soldiers.". Whereas, it was trap of Tiryaki Hasan Pasha. Tiryaki Hasan Pasha knew Hungarian soldiers were disgruntled in Austrian army. Hungarian soldiers did not want to fight with Ottomans. Hungarian soldiers ran to Austrian camp. They told status. Austrian commanders were sad for this problem. Austrian army, a day later, attacked castle general. Nevetheless, Ottoman castle resisted. Nearly 18 thousan Austrian - Hungarian soldiers died in front of castle. But, part of castle destroyed. Also, a few Ottoman soldiers fled from castle. They ran to Austrian camp and told everything. This problem was very dangerous for Ottomans. But, Tiryaki Hasan Pasha was very smart... He sent a few Austrian prisoners. And said them; "I sent a few Ottoman spy, did they reach Austrian camp?". Austrian prisoners went to Austrian camp. They told this problem. This trap was witty. Austrian commanders believed them. Ottoman prisoners were killed. Not only that, Tiryaki Pasha wrote fake letter. Austrian soldiers seized this letter. On this letter, Hungarian soldiers supported Ottomans secretly. Austrian commanders surprised, and decided kill Hungarian commanders. Hungarian soldiers revolted. Thus, Austrian army disintegrated. Tiryaki Hasan Pasha's traps were very witty. Tiryaki Hasan Pasha decided attack Austrian camp. Ottoman soldiers left castle and attacked Austrian - Hungarian army. Already, Hungarian soldiers were rebel. Austrian army destroyed easily. A lot of Austrian soldiers died. Nearly 80 thousand Austrian soldiers died. Ottoman soldiers capture 47 big cannons, 14 thousand rifles, 60 thousand tents, a lot of food. After this victory, Tiryaki Hasan Pasha's aide Kara Ömer Agha attacked Austrian area with a little army. This little army captured 3 thousand villages and a lot of booties. This page was last edited on 7 May 2016, at 03:49.